Anyone else notice that the lattice on the left side of the frame doesn’t show up on the right side?? The only thing that provided clues to the scale of the clock was the clock face and hands. Fortunately, I was able to find the exact clock face on Clockprints.com. The smallest size had 3” time ring , with 4-5/8” art on 6” paper which I promptly ordered for the prototype. Other sites I have used include Klockit and Schlabaugh & Sons. Clock faces are generally printed on high quality paper using graphics art printing processes to provide high quality, long lasting faces. They can be purchased in sheet form, with backing board, laminated, glossy, matte, you name it. Generally, I purchase the clock face on a backing board without the movement hole drilled in it. For two of the clocks, I made the clock face from exotic wood. There are myriads of sites that come up by searching “clock face”. Most of them appear to use similar language explaining the pertinent terms. One of the most important is the time ring, which is the diameter of outside edges of the hour numbers or markers. Divide the diameter by two. That measurement will give you the minute hand length which is also used as the clock hand length. You don’t want a size that is larger than the recommended length or else the minute hand will be stick outside of the time ring. Klockit and Schlabaugh & Sons have multiple sizes and styles of hands to choose from when purchasing a movement. If the exact size isn’t available, use the next smaller size. I got a little ahead of myself discussing hands. After deciding on the clock face size decide what kind of clock movement to use. There are numerous kinds of movements out there. 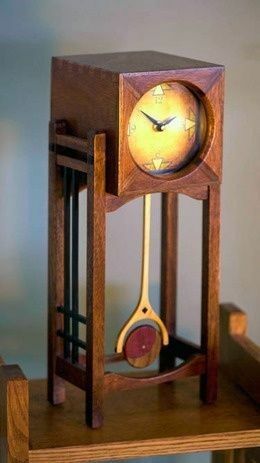 Klockit and Schlabaugh & Sons sell Quartz pendulum movements that work well for this kind of clock. I chose a basic Pendulum Quartz Clock Movement which includes the pendulum rod, bob, and hands. At this point you need to know how thick the clock face (dial) will be because one of the ordering options is maximum dial thickness. The dial thickness dictates how long the threaded shaft on the dial needs to be. Check different movements and also different sites as everyone seems to have a slightly different selection. I didn’t want a second hand but that is an option, as is a chime. You should also be able to select the hour/minute hands using the size determined above. If the hand selection for that movement doesn’t include the size/style you want, check around. There are so many options to choose from. No matter what kind of clock you want to build, choosing the clock face and movement needs to happen before anything else can begin. From here the clock box design can begin. Thanks, Earl. A clock is now on my list of projects. I was wondering about the sizing of the hands and now you provided the answer before I could ask. Looking forward to the rest of this blog. Thanks for posting it Earl! Good stuff Earl. I can’t wait to see my clock be born. Thanks again. Good Blog thanks for sharing. Thanks for all the useful info Earl. I might want to build some clocks as Christmas gifts and this blog should therefore be very helpful. Interesting, I’ll follow this. So, is there a reason the lattice isn’t on both sides of the base? Why is it I suspect my making it up as I go, and your making it up as you go are almost completely different animals? I’m looking forward to watching though. Dave – I suspect that you are comparing my finished “make it up as I go” to your actual “make it up as you go”. I spent 3+ months working on this, or more accurately, trying stuff out, pondering, looking at it, pondering, throwing stuff away that I messed up (measure, cut, realize I forgot to include a dimension, throw away) that is why my shorts bin has so much stuff in it. Your “made up” work usually includes a lot of thinking on my part (think Fibbonaci gauge) just to follow the math you did. And I’m happy for your shorts bin, Earl. The Fibonacci gauges (I made another yesterday) all came almost directly from your shorts bin. Plus, I needed to make a sheath for a knife this afternoon, and two offcuts from the Fibonacci gauges, plus a piece of eucalyptus that was a failed plane wedge from the swap ended up doing a pretty good job. The only thing I measured when making this knife was the width of the blade, so I knew how big of a hole to drill in the brass. Everything else, including the sheath, was trial and error. I think it came out ok, though. I did have to spend about an hour widening the narrow slot that the knife goes in after I had glued everything up, though. Bother.